Last Saturday we applied a herbicide to the Lily Pads on the lake. About 50% were treated. An additional treatment is planned for this weekend the 11th or 12th to complete the treatment. The chemical used is a Glyphosate-based herbicide sprayed on top of the water. It is a broad spectrum, non-selective herbicide that essentially kill any surface plant they come into contact with, but neither kills plants that live under the surface of the water. There are no swimming, fishing or irrigation restrictions. For additional information about the chemicals being used see the links below. McCloud Aquatic Services apply a plant treatment to the lake on Thursday, April 20th. The process is expected to take between 4-6 Hours. 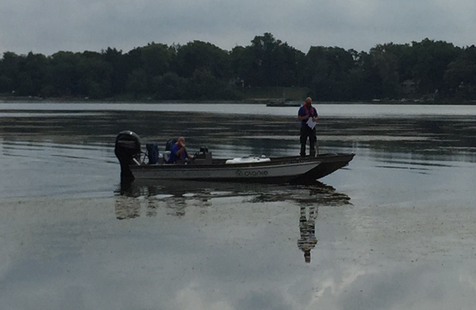 Sonar AS (Floridone) will be used to treat the Eurasian Water Milfoil in Highland Lake. This year (2017) the targeted application rate of Sonar AS will be 9 parts per billion or ppb. FasTEST will be performed at 14, 30, and 45 days following the initial application to determine the concentration of Sonar AS in the water. 1. No swimming or boating of any kind for 24 hours. THERE ARE NO SAFETY ISSUES but it is suggested to refrain from activities to keep from disrupting the chemical application. 2. Irrigation information see below. Follow the following time frames and assay directions to reduce the potential for injury to vegetation irrigated with water treated with Sonar A.S. Greater potential for crop injury occurs where Sonar A.S. treated water is applied to crops grown on low organic and sandy soils. For purposes of Sonar A.S. labeling, a pond is defined as a body of water 10 acres or less in size. A lake or reservoir is greater than 10 acres. Where the use of Sonar A.S. treated water is desired for irrigating crops prior to the time frames established above, the use of a FasTEST assay is recommended to measure the concentration in the treated water. Where a FasTEST has determined that the concentrations are less than 10 parts per billion, there are no irrigation precautions for irrigating established tree crops, established row crops or turf. For tomatoes, peppers or other plants within the Solanaceae family and newly seeded crops or newly seeded grasses such as overseeded golf course greens, do not use Sonar a.S. treated water if measured fluridone concentrations are greater than 5 ppb. furthermore, when rotating crops, do not plant members of the Solanaceae family in land that has been previously irrigated with fluridone concentrations in excess of 5 ppb. it is recommended that an aquatic specialist be consulted prior to commencing irrigation of these sites. Today Clark was out inspecting the lake. The preform a sonar survey at least twice a year. Once before treatment and once after treatment and the growing season. See the plant life comparison vs last year below. This point forward we will now have hard data that we can look back on and make lake management decisions based on data and what has happened in the past. There’s a huge amount of information that will now be available using this technology and GPS tracking of plant locations. This will be very beneficial to us as far as making management decisions and will hopefully lead to reduced expenses incurred during future plant treatments. See the lake reports collected from August and September. This year Marc Rosemeyer along with other residents input and the boards help put together a solid fish stocking. In fact there has been no fish stocking since 11/08/13. During this round of stocking, funds raised during Carp Fest over the years accounted for about $900 of the $1,900 fish stocking this year. On 10/31/15 we stocked 500 (6 to 8 inch walleye) and 57 (12 inch plus northern pike). Click here to video the fish stocking video. Its up to all the Highland Lake residents to make sure that this lake does not become infested with Zebra mussels. If you or someone else places a boat on the water that has been on another lake it needs to be inspected and cleaned thoroughly as listed in the attachment below. Zebra mussels can spread to our lake not only from boats but, minnow buckets, fishing nets, kids sand bucket and water toys and dog collars. Anything item that is placed in another body of water and is put in our lake could transport zebra mussels and cause our lake to become infested. Click here to review boat inspection and cleaning instructions. See this zebra mussel fact sheet. Here is a list of local area lakes that are reported to have Zebra mussels. We met with the applicator on 7/22/15 to get an update on our plant treatment program. The meeting went really well, we feel the timing and the direction we are heading in terms of lake management are really good. Click here to view a summary of the meeting by Mike Kalstrup. Clarke Environmental is scheduled to be applying treatment to the lake the morning of June 11th. The process is expected to take between 4-6 Hours. 1. No swimming or boating of any kind for 24 hours. THERE ARE NO SAFETY ISSUES but it is suggested to refrain from activities to keep from disrupting the chemical application. Please do not use the lake or raft until Friday evening. 2. No irrigation for 21 days. The DMA IV (2,4-D) used to treat the Eurasian Water Milfoil in the lake may be strong enough to harm lawn and plants so we ask that you refrain from these activities until July 3rd. After a detailed review of data collected from Clarke, inspections of the condition of the lake and discussion of the Lake Management Committee, the following is the recommended treatment. The committee recommends that Clarke use the Conserve method to treat the areas enclosed in the black lines on the map in the attachment. The treatment should take place as soon as possible. We will advise the community when the date is determined. Click here to view the Recommended Treatment Area Map and additional information. Please click here to review current information for this years plant treatment and also the lake monitoring testing. 10/15/14 Lake Secchi Results From September 17th. Click here to review our current lake conditions. Also if you would like to help with the lake monitoring process please contact your shore vice president. Click here to see the lake Secchi disk readings through the summer along with plant growth and lake conditions. Several buoy have been placed on the lake where there are beds of Eurasian Water Milfoil. Majority of them are placed in the area out in front of the inlet SW corner and also the SE corner by Szontag Park. We ask that you try to avoid boating through these areas to prevent fragmentation of the plant. This will help reduce the spread of this nuisance species to other areas of the lake. Click here to see the buoys. In cities and suburbs, the incremental runoff of the nutrient phosphorus (P) from sources like lawn fertilizer—whether organic or conventional—is a serious concern because it feeds algae and weeds in waterways. Research suggests that just one pound of phosphorus can feed 300-500 pounds of algae in a water body. While most algae blooms are generally harmless to humans, decomposing algae and weeds take up oxygen in the water that is vital to fish and other animals. Furthermore, algae and weeds discourage swimmers, anglers, and boaters. Click here to visit this website to learn more. Last year ours and many lakes in the area experienced extreme algae blooms that resulted in questions on how this can affect our lake. Click here to read more about algae blooms from an informational document produced by the Illinois EPA's Voluntary Lake Monitoring Program. Mike took Secchi readings for our lake on 5/30/14. The current surface temperature is 73.6°. The lake level is 6 inches above normal. Plants spotted were stands of curlyleaf pond weed. The majority of it being on the west end of the lake primarily the southwest corner out anywhere from 75 to 125 yards from shore. The other plants reported were Sago pond weed, spatter dock, white waterlily, chara, and floating leaf pond weed. We will be able to start entering more data online and have access to all the charts and graphs in order to compare to previous years. Not sure when we will be able to access this data as it is work in progress. Mike is always looking for help with the Secchi reading and other lake monitoring tasks. If you are interested please contact Mike at 847-548-2401. Click here to see the readings posted with the Lake County Lakes Management Unit. Click here to see the lake monitoring report performed by Aquatic Ecosystems Management. Treatment started around 10:30 am on the 6th. by Nick Gowe. Jake Britton the SePro rep was out to assess lake conditions, water level, outflow rate, and take water temp readings. Temp readings are very important and are done to check for thermocline which can affect the dispersal/ dissolution of the product used. This was factored in to the calculation to determine the amount of Sonar to be applied. Sonar AS was injected subsurface throughout the lake. The desired rate is 8 PPB at the time of application. A rate between 8 ppb and not dropping below 6 ppb is what is being targeted. We will be taking samples from three different locations this week for FasTest. These 3 tests will be averaged together to determine how close the actual ppb levels are after the application. This will determine if additional treatment is needed which is included in our contract with the applicator. Click here to see the picture slide show from the 5/6 plant treatment. 5/2/13 Full Lake Plant Treatment To Take Place On Monday May 6th. Highland Lake will be treated for invasive plants on Monday morning, May 6, 2013. The health of Highland Lake is the top priority of everyone in our neighborhood. There will be no danger to desirable plants, humans or animals due to the low dosage that will be applied. The lake water can be used immediately for watering, fishing and swimming after the treatment. This application will be a full lake treatment. The herbicide to be used is (Floridone) under the product name Sonar A.S.. The manufacturer of the product is SePRO. Click here for the material safety data and here for the product label sheets for additional information. We thank the residents of Highland Lake for paying their dues and making this treatment possible. This fall we will be stocking several fish through our budgeted funds and money collected during this years Carp Fest. We would like to thank Ron Siggemen for helping to order these fish. We will stock 400 Smallmouth Bass, 300 Walleye and 20 Tiger Musky. Click here to read information from our Illinois government regarding blue/green algae and cautions to be aware for us and our pets. Illinois boaters will soon need to think twice before launching at area lakes. New legislation targets the spread of invasive plant species by penalizing owners with weeds attached to their boats, the so-called "aquatic hitchhikers" that have put a major strain on lake ecosystems across northern Illinois. A bill awaiting Gov. Pat Quinn's signature would impose fines for violators. "It's not about collecting fines we're trying to be friendly and educate with these regulations," said State Rep. JoAnn Osmond of Gurnee, the bill's sponsor. Click here for more details. The Lake Plant Treatment took place on July 6th. About 30 acres of the lake was treated, The target was Eurasian water milfoil. The herbicide used was 2-4-D to knock out the Eurasian water milfoil and Reward to clear swimming and boating lanes from the parks. Click to view the MSDS sheet and product label for the 2-4-D and view the Reward MSDS sheet and product label for Reward. 7/13/11 Stop The Spread Of Aquatic Hitchhikers ! Clear here to view this pamphlet showing tip on how to stop these invasive species from getting into our lake. 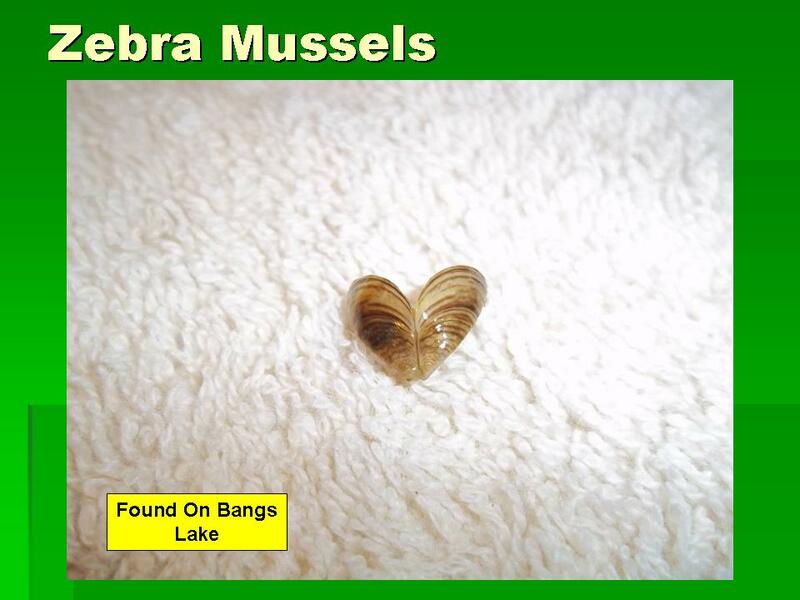 To see what a Zebra mussels looks like click here. This Zebra mussel was found on Bangs lake in Wauconda and was picked up by a child that thought it was cool. It's possible this Zebra mussel could have found it's way into our lake, but in this case it did not. We must keep a watchful eye to stop this from happening. Please click here to review the report that was completed my Mike Kalstrup on 6/21/11. Click here to see the plant tour on our lake. Make sure to scroll down on the page to locate the video. Thanks to Leonard and Monica from the Lake Lakes management units for coming out and doing this for us. Click here to see an extensive presentation covering additional information about Zebra Mussels that are a threat to all of our area lakes as well as Highland Lake. We will need to be very careful when launch new boats on our lake to make sure that the Zebra mussel is not attached to the hulls of these boats. Click here to view a list of local water bodies and rivers here in the area that are known to have zebra mussel populations. Click here to read a documents that show how to treat boats in order to prevent the further spread. Keep in mind that boats alone are not the only way that these exotics are spread i.e. bait buckets, inner tubes and other flotation devices and so on. Look for more information to be posted in the future. Many board member met with Mike Kalstrup to discuss how to ensure that Zebra mussels do not find it way into our lake. Zebra Mussels are now found in our area from the Fox Chain Of Lakes to West Loon Lake and many others close by. Currently there are is not a way to remove them once they find their way into a water way, so the best way to keep them out is to make sure that when a boat is launched on our lake that the hull in inspected for these critters and not placed on the lake until they are removed. Click here for additional information. Look for more information and education to be listed here in the next several months leading up to the 2011 boating season. Click here to view our lake management goals for the future that was presented by Mike Kalstrup during last months board meeting. 10/29/10 Annual Highland Lake Water Clarity Information. The annual Secchi reading report has been completed. Our water clarity in continuing to improve over 2009 and 2008. And we currently have a reading of 105 inches or 8.75ft. which places us in the top 20 clearest lakes in Illinois that participates in the Voluntary Lake Monitoring Program (VLMP) program. We need to continue are efforts in lake management to continue in this direction in the future. Please click here to view the readings taken and their location. 10/19/10 What Is The VLMP? The Volunteer Lake Monitoring Program started in 1980. It's main purpose is to improve water quality in our Illinois lakes. The Illinois EPA who administers this program allows normal citizens to be responsible for gathering the data for lakes in their area. In exchange the IEPA offers training on how to collect this lake data through the use of secchi readings. These readings are a valuable tool when considering the health of lake and what needs to be done in the future to improve water quality. 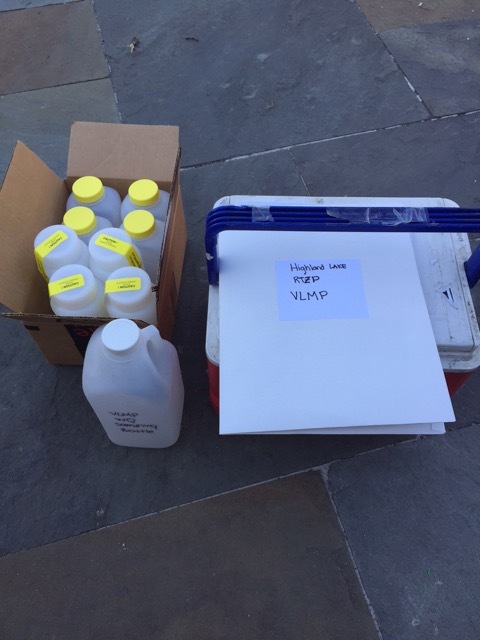 For more information about the VLMP click here. Mike Kalstrup is also looking for your help in taking secchi readings on our lake. If you are interested please contact Mike at mkalstrup@me.com. Tom Brust the new Avon Township Highway Commissioner provided information to the board about a RAIN GARDEN that will be installed in Chic Park to impede the flow of storm water into the lake. This will be a part of the road resurfacing project that will take place this October. The purpose of Rain Gardens is to slow the rate of run-off and detain it to let the flow of heavy-metal-oil and gas-laden road runoff settle out before the volume of this hits the lake water. 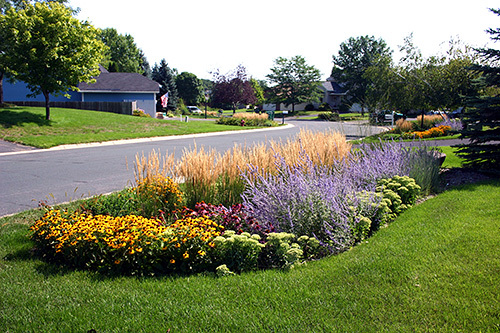 Rain Gardens are filled with natural flowers and plants! Rain gardens then absorb and filter the water. There is rarely a time, if ever, that there is water standing in a rain garden. Click here at see what a Rain Garden looks like. 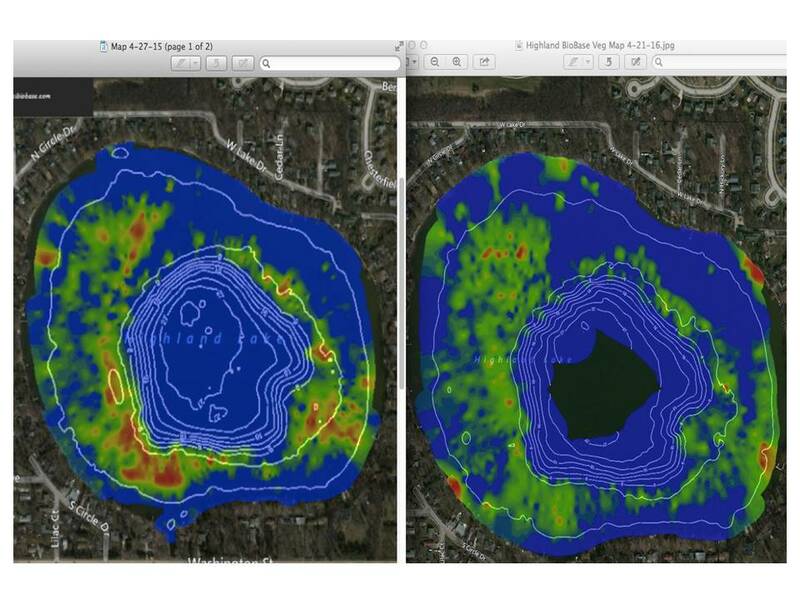 Mike Kalstrup has put together a great presentation that covers the plants found in our lake during the Lake County Health Departments survey conducted in 2009. This program will help educate us on how to properly identify our lakes plant species and how these plants affect our lakes ecology and health. This is an interactive presentation with a short quiz at the end to test your knowledge of what you have learned. If you can not complete the presentation, it will save your spot allowing you to start were you left off. If the presentation does not play you will need to download adobe flash player. Most of you will not need to do so if you watch video on the web already. Click here to view the presentation and have fun. ALBANY, N.Y. A new law to improve water quality makes it illegal for stores in New York to stock fresh supplies of household dishwasher detergents that contain phosphorus. Stores will have 60 days to sell old inventories. New York will also ban fertilizers contain phosphorous in 2012. Click here for more details. Lots of Algae has been seen in the lake this year. One of the causes is chemical fertilizers containing phosphorus. Phosphorous is now AGAINST THE LAW, signed off by the governor this month. If you use a commercial applicator, ask them to apply non-phosphorous lawn fertilizer. Your favorite store has non-phosphorus (Look for the ZERO on the front of the bag.) Click here to read the complete story. Now is a good time to rake out this plant (see a photo here) from your shores. This is a cold water plant that will begin to die out when the water reaches 70 degrees. Currently this plant is not a nuisance on the lake yet, but if you do see some on your shoreline it's not a bad idea to remove it. As this plant dies it will begin to turn brown in color. Illinois has many invasive species. The following is not a comprehensive list of all invasive species in Illinois, instead it provides examples of each category of invasive species. Use the links below to view pictures and learn more about this species. Learning to identify invasive species is a critical part of raising awareness. Click here for more details. Here is the link for the coveted complete Squaw Creek Watershed hand book that is posted on the Lake County website. It contains very important information as to our lakes role in the watershed. Frank Jakubicek of the Illinois DNR presented his Highland Lake report during the March 15th board meeting. Click here to view the report. Mike Kalstrup, HLPOA VP and chairman of the Sustainable Lakes Committee has obtained a price list from Grayslake Feed Sales on Center St. located in downtown Grayslake of Phos Free” fertilizers. Click here to view the price list. This phosphorous free fertilizer helps us maintain lake water and fishery quality. Make sure to use this type fertilizer when managing your properties. Protect our lake harmful fertilizer run off and save money when applying fertilizers to you lawn or garden. Contact the Lake County Soil and Water Conservation District at www.lakeswcd.org For a small $20 fee you can have your soils tested. Click here to view a map of our community and see the types of soils in our area. Your Sustainable Lake Committee believes this information is important prior to the snow and ice melting. Let now start thinking spring and your attention turning to your lawns. Click here to view some important facts about fertilizer. Leonard Dane from the Lakes Management Unit presented a full version of our lake assessment during Monday's board meeting. Click here to view his presentation. Leonard has also provided our new bathymetric map and morphometric data that they created this past summer. The final 75 page report should be available in March and will be posted on the site. The LMU has finished up their final Highland Lake report. Lenard Dane is planning on presenting this information at the February board meeting. It will also include information from the Illinois DNR report as well. Frank Jakubicek the regional fisheries biologist form the ILDNR has agreed to come out and present his report and answer questions at the March meeting. Click here to see the Illinois DNR lake report. Also see this important meeting flyer coming up on Lawn Care basics by the Illinois Lakes Management Association. Frank Jakubicek from the Illinois (DNR) has completed their Electro shocking of the lake on 10/13 in order to perform a fish count. His official report will be completed in January of 2010. Click here for brief summary of the fish shocking. There have been some concerns about 20 musky that were stocked last fall and speculation about how that would affect the fish population. This question was asked to Frank during his visit. He said "That if the DNR would stock musky in a lake like our they would put in 2 fish per acre or over 200 musky per year until a self sustaining population would be present. This would usually take several years of stocking." It was also thought that stocking muskies in our lake would lead to a degraded fishery on our lake. The DNR stated that this is found to be not true. A recent study was done to see the impact of muskies on a lake and their diet. Please see the report and the other supporting documents. Click here to see the photo from the DNR's visit. Thanks to John Murphy for the fine pictures. Leonard Dane has provided us with his presentation that was given at the last board meeting. Please click here to view his presentation. Should you have any questions for Leonard, please send us and email us and we will try to get you an answer. Mike Kalstrup has put together a graph showing the number and type of fish stocked in Highland lake. Mike put this together using records provided by Ron Siggeman, Jack Fiore and treasurer's receipts from fish stockings. Click here to view the report.